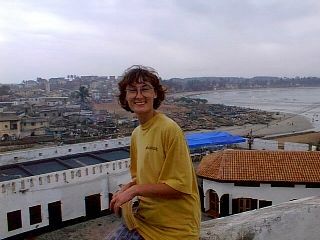 It was a real treat to be in Ghana where we could speak English. Spending time in a hotel in central Accra was a highlight (despite being disappointed that Punda was on a container ship) because we could interact with the locals and try out loads of delicious local foods. Just about made it across the border before it closed and we were immediately met by requests for "cadeaux". We told the children that the word was "present" and that "no, we don't have any, so don't ask any more". It was so good to be in an anglophone country again and it is only when you get here that you realise how challenging life was in the Francophone countries. From now on, with the exception of Mozambique, it is all English speaking. After paying the £5 "road fund" donation required by all vehicles crossing the border we stood on the scales usually used for weighing bags! I was curious to see what effect the lack of dairy products and booze had made. If the scales were right then serious weight loss has occurred. We will have to stand on the airport scales for confirmation. Andrew thinks that we could sell African holidays to fat Europeans. The "no booze, no dairy and high diarrhoea" diet can guarantee a minimum weightloss of half a stone per month! We were rushed through the formalities (home time was approaching), noticing that the last travellers to go through that border with a carnet were Viking and Chief who's progress we have been following with keen interest. Their website has been an absolute goldmine for tips. We changed our remaining CFA's into Ghanain cedis at a fuel station at a very good rate. Akosombo Dam was interesting. 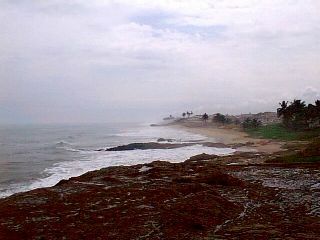 It is responsible for producing most of Ghanas electricity and has created the worlds largest manmade lake - Volta Lake. The lake glistened within beautiful mountainous scenery. You can go on an external tour of the dam for £2 each (was free last year). The local water authority (and Volta Hotel) appears to be doing a very good job of cashing in on the tourists. We had a look at the dam from a distance and concluded that it was just like any other. We managed to resist going on the "Dodi Princess" cruise (sailing the following day) on the lake and instead bought fish from a local seller before moving on to Accra. We hoped the Tilapia didn't have any tiny bones like our last fresh fishy disasters. One of the first things that we noticed about Ghana is the flowers. After four months in West Africa this is the first country with flowers. They even have gardens here. It is reminiscent of Hawaii. I don't know whether it is Ghana itself or the understanding (to some degree) of the language that makes the difference but there is a real sense of humour here. Of course it may have been present in the Francophone countries and we just missed it. Shops have funny names such as "girl love". It is so good to be here and we were delighted to see Land Rovers galore, red post boxes and fire engines. Along the road sides, between houses, there are graves where the locals plant their dead. The roads are excellent - better than any in West Africa. Villages are positioned off side roads rather than directly off the main roads. The differences between here and the Francophone countries are quite marked. We are not sure about the local culinary favourites though: bat, rat or cat! For some reason the locals still call us "les blancs" and we keep saying "merci, monsieur" to the officials. A difficult habit to get out of. At Accra we got some mobile phone signal. In the last three countries we had signal but no contract. At last we could pacify the relatives. 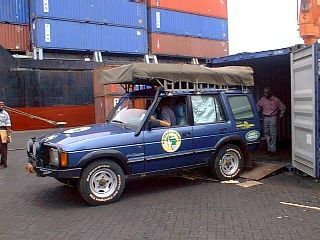 We also picked up a message from Sally and Noel saying they were at Kumasi, 250 km away having their chassis replaced. We will see them later in the week. Accra isn't the easiest town to drive around but we managed to get through it and out on the road towards the beach and "Big Milly's Backyard". 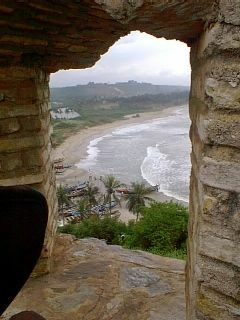 What a great place. It is full of English speaking tourists. I don't know why I was so surprised - the English speakers usually go to English speaking countries. There aren't many of us daft enough to go to French speaking ones! 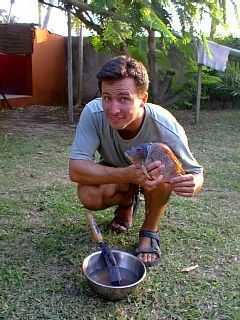 That night we had our Tilapia. What a glorious fish - should have known there wouldn't be many bones - I was using a Keith Floyd recipe. He wouldn't be cooking something which took ages to eat and therefore interfered with his wine drinking! We finally opened the bottle of Sauvignon Blanc that we have been carrying around with us since The Gambia waiting for a special occasion. 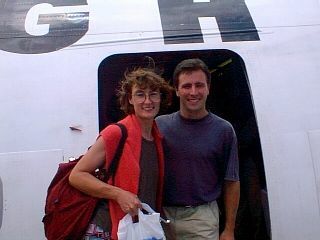 We had that occasion - we are in Ghana and it was a real treat. Despite having no electricity, no running water, twenty million cockerels and bats that beep all night (no wonder the locals eat them) Millys is a really good place. There wasn't a lot to do there so we just veged out, feasted on baked beans and proved to the locals that Andrew really is a beginner when it comes to playing guitar. Monday 16th was time for business. We spent the day establishing the costs of flights from Ghana to Cape Town and Jo'burg. Most airlines were ridiculously expensive and had to go via their "home" country. Ghana Airways (GA) and South African Airlines (SAA) are partners here and offered the same rate and "no deals". We tried out some street food and it was delicious - spicy, like curry. The woman said it was goat but it tasted very much like lamb. We will be having more street food once the car is shipped and we are looking forward to it. The marmite ran out this morning and we thought we would have to make do with sniffing the jar. However a local supermarket stocked the tiny jars at £1.50 each. Andrew thought that nine jars would be sufficient for a couple of months! Camped in the garden of a guesthouse in Cocoa Beach. The place won our "best view from a loo" award. The next day our man from the shipping office was away so we spent the day in a cybercafe and visiting other supermarkets. I thought I'd gone to heaven when I walked into one shop and they were stocking Tesco goods. Can you believe it - I bought a jar of Tesco's lemon curd in Ghana. Fantastic! Headed off to Pram Pram where we were due to rendezvous with Noel, Sally & Turtle that night. 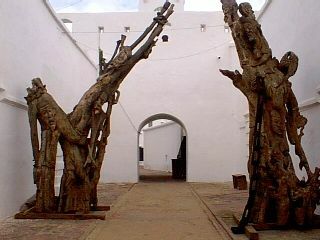 The town was having a week of celebrations - a festival of something or other a bit beyond our beliefs. Anyway the town was buzzing and we were invited to a local bar by Kingsley (son of the campsite owner) for a "Star" beer and a deafening experience next to the speakers. These Africans like their music loud. Some of the locals were pushing giant speakers around the town in wheelbarrows. Spied Turtle tracks in the sand on the return journey to the site and we were delighted to meet up again with Sally and Noel and catch up on the gossip. They didn't think they were going to make it that night. The new chassis was great but the car had been wired up incorrectly and things didn't quite work as expected. In the morning we made our way to Tema to sort out shipping stuff and suffered our first puncture - right in a pile of tar that was resting on the road. At the Saga Offices we met up with Matt Taylor from P&O Nedlloyd. He was on loan from the UK office for a month and it was so refreshing being able to conduct business with someone who could understand us and whom we could understand. Trying to do business with the locals here is pretty much a hit and miss affair. It was an absolute delight being able to deal with Matt - we could trust him entirely and knew that things would get done properly. It is no wonder that we struggled with African French because African English is almost impossible to understand. Education appears to be seriously lacking here. Children are too busy hawking to go to school. The lack of knowledge and grasp of ideas and comprehension is quite astounding. We spent ages again in the SAA and GA offices trying to get them to match the flight prices offered by GA in Lome. Not a hope. 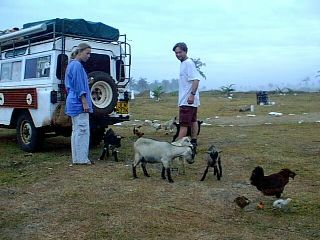 In fact, the Africans were flipping rude and laughed in our faces when we quoted the cheapest price we had been given. Also, once they have established that you are not going to buy their tickets they are not interested in you any more and dismiss you by engaging in a conversation with their mate (who has been sitting beside you and also laughing at the prices quoted). Customer service or customer satisfaction is unheard of. Given that the Africans here haven't got a grasp of the English language yet I suppose it is a little naive to expect them to understand "tact" or "wit". I walked out of their offices feeling really frustrated - at not being able to give them all a good slap! It is incredible - this "I can't be bothered to help you" attitude is rife in Africa. GA in Accra eventually asked us if we qualified for their 20% discount offer, ie. if you are married or if you want a family ticket. Of course we said "yes" but they didn't believe us particularly as all the names in the passports were different. In their culture married people have the same name and that is that - there is no budging them. We were in no position to prove anything so had to leave. We had an early start the following morning as it was a day of "missions". Sally and Noel went on a 200 km round journey to Togo to visit the GA office in Lome. Armed with our passports and as much wad in dollars as we could all muster they went to buy the cheap flights. They had multiple entry Ghana visas (unlike us) and would be able to get back into the country. We fought off the Accra traffic which rivalled that of London in rush our to get to the Land Rover garage for 9am to replace the bushes and hopefully get rid of clonky. The mechanic was meant to have gone off for the parts at 8am and be back for a 9am fitting. In true African fashion our half hour job took six hours. The chap hadn't left when we arrived, then he brought the wrong ones, then he brought two, then he brought the other two! We sent another minion off for 2x 5litre bottles of "turbo diesel" oil and he returned with 8x 1litre bottles of "diesel" oil. However, we did get a new alternator belt at last and the parts prices here are much the same as in the UK. We weren't able to pay the bill as Willie had left but we promised to return tomorrow. The locals are very trusting of white guys. 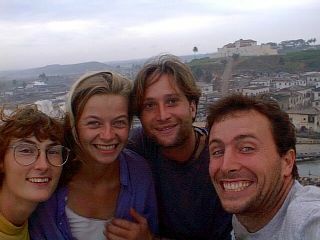 Our other mission that day was to finalise shipping arrangements which we did with Matt very successfully. That night Turtle returned with great news on the flights. It had been a successful day - the ship was sorted, we couldn't hear clonky any more and the flight costs came in at even less than we had been quoted when we were in Togo (cash deal in CFA). The inconvenience of making a day trip to Togo and the extra expense of having a Ghana multiple entry visa is definitely worthwhile given the savings made on the air tickets. The irony is that we were booked on a GA flight from Accra - the same flight as we would have been on if we had bought the tickets from Ghana at extortionately greater cost. Our tickets even included a bus fare from Lome to Accra! We celebrated with a delicious tuna fish pasta. On the radio there was talk of reparations being sought by West Africa for the losses suffered as a result of the slave trade. We couldn't believe it because so many African kings were involved in the selection of slaves. It wasn't just the west who were benefiting. In the morning whilst trying to do jobs on the car we were inundated by locals wanting a chat, a biscuit or a look inside the car. They talk to you but their eyes are wandering about your belongings. They are not interested in stealing but will willingly ask for something that takes their fancy. Andrew shut the back door to stop people peering in and managed to trap and kill the tea strainer in the process. It is beyond a further weld. Finally managed to buy some Artesunate - the Chinese treatment for malaria. Apparently it works a treat. We tried to get some in the UK before we left but no-one was touching it as it hadn't been through the years and years of clinical trials required by the UK before they will let anything loose on the public. Anyway we have two packets, and at three pounds each is a much cheaper option than Fansidar. We returned to the Land Rover garage to pay the bill. They were starting to get a little worried as we were late, particularly as our bill amounted to about half a years wages for the most junior staff. We were pleasantly surprised - £4 labour and the rest parts at the same price as we would have paid in the UK. We would highly recommend this garage - M.K. 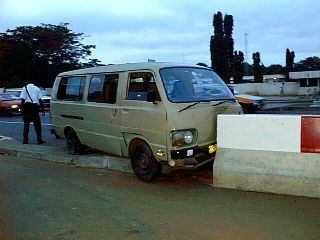 Engineering Works, Coast Road (2-3km north of Nkrumah Circle). Spent the night at Big Milly's before moving on to Cape Coast and Elmina in the morning to visit the forts built by the Europeans to house the slaves before deportment. These are incredible places where you can get a real sense of history and put into perspective the affluence of the westerners and the diabolical conditions suffered by the slaves. 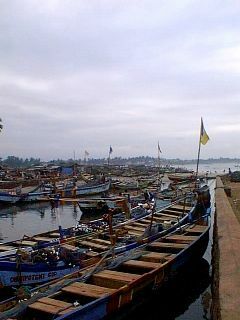 Having visited Benin and Togo it was possible to see the effect of the slave trade along the coast. Elmina is a vibrant fishing village and we were delighted to watch the activities of the town from our vantage point in the fort. Camped at Amonabu Beach Resort and splashed out on a dinner in the restaurant. This is a lovely place and we would have liked to have stayed for a little longer but time was pressing on. In the morning Andrew and I went to Kakum National Park while Sally and Noel returned to Accra to sort out some work on Turtle. 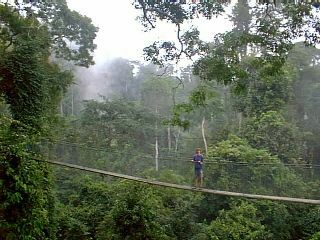 Kakum has seven high canopy walks above the rainforest which you can cross when on their one hour tours (longer if you wish to pay extra). The walks are at 40m above the forest floor. It was so beautiful and peaceful. We didn't see any animals but we could hear them. 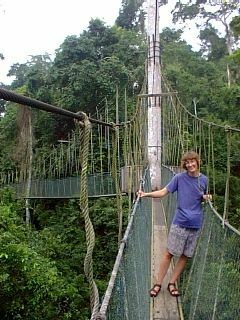 It is possible to go on walking tours and/or the canopy walk. All activities must be with a guide and you pay for the privilege. Tourists are charged 22,000 cedis, locals pay 4,000 cedis. These days I seem to have many arguments with locals about their prices. I still cannot figure out how 22,000 cedis + 500 cedis equals 22,000 cedis! The man behind the desk could make sense of it and tried to explain it to me. Talk about getting nowhere. It just doesn't work and he thought it did. After ten minutes it was just too much arguing over 12p. Andrew and I came to the conclusion that if you try and understand these people you would die of frustration before you got there. Another puncture. The same wheel in fact. The same hole in fact only four times the size. This time we replaced the inner tube. Back at our rendezvous point at Big Milly's we all had plantain curry followed by beers on the beach whilst listening to the local drum band. Two and a half hours were spent at the bank in the morning trying to get a credit card cash advance. Talk about a lengthy process and the banks ripping you off. They ask you how much you want, convert it to pounds at the worst possible exchange rate, charge you in pounds on the credit card slip, pay you in local currency and then charge you commission. Sadly Ghana is independent of the central financing of many West African countries and therefore has its own currency. We had to recover with a Guinness at Ryans Irish Pub which apparently is the only place in West Africa where you can get draught Guinness - and pay UK prices! Disappointment followed when we found out that the chawarma bar we had hoped to visit for lunch had been demolished a week ago. Talk about rotten luck. The return to Pram Pram saw us tidying the car, packing things away and packing bags for two weeks in hostels. The Golden Beach Club is a really cheap (90p per night each) and pleasant place to stay. Emanuel, the owner has big plans for the place as currently there isn't much to do there apart from listen to the dreadful "peace fm" which blares out of the radio from 6am in the morning. It is a bit of a meeting place for the locals too who believe in paying a visit to the tourists in the hope of being given something. Try they might, fail they do! They just don't stop pestering and will demand things in a far from polite manner. "Give me money"; "Give me something"; "You've got bread, give me some" are everyday demands and despite being here for months we still have not got used to it. That night we used up the last bits of perishable food and placed the South Africa map next to the passenger seat in preparation for later adventures. The day arrived for Pundas journey on the boat. 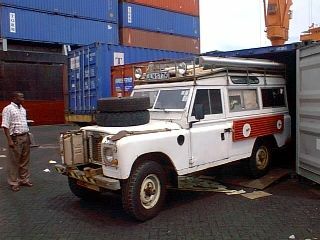 After filling up with cheap Ghanian fuel and giving her a wash we drove her into the P&O container with Turtle for the 10 day journey to Cape Town. The process was reasonably quick and painless other than the loss we felt at losing our home and car. It was all a bit devastating but in a way also exciting because we were having the opportunity of staying in town and seeing the sights on foot without worrying about the car. The P&O staff looked after us exceptionally well then we were on our own. A taxi took us into Accra where we checked into the Date Hotel. It was a bit of a come down after Punda but was only costing us £4 per night for the two of us and the hotel was pretty central. Tried some "fufu" - the national dish. Talk about disgusting. It was a blob of white grolly-like stuff served on a dish of spicy sauce. You are meant to tear off a piece of this rubber and down it in one. It is completely tasteless and makes you gag when you swallow. The Ghanaians use a lot of hot pepper sauce and powder in their cooking . For some reason it is known as "shito"! It was good to be based in town for a little while - to see the sights on foot and to try the local food. Just walking around was a really pleasant affair. We all took a taxi to the Ghanian film institute where we had read that they show the latest Hollywood films. Well we thought we had dipped out when we had the option of a local film or the Jackie Chan movie. We took the latter and had a really good laugh. It was so good to get to a cinema again. That night it was really hot in the hotel room. No more ventilation through the tent mozzie nets for a while. The fan was ridiculously noisy and we got bitten almost to death by the mozzies who were feasting on us as we hung out of the sleeping bags. The next morning we visited the National Museum which exhibited items from Ghanas history such as Ashanti stools, relics from the slave trade and fertility dolls. It was a really fascinating place. Afterwards we walked around the town taking in the atmosphere around the markets. Everyone here is so happy and it was so humbling to watch people really struggle to make a living. We found the "Roxy" cinema where we paid the entry fee of 12p each to watch the 6.30pm movie. When we walked through the doors we discovered it was an open air cinema. The film was a video projected somehow on to a white wall and we missed all the best bits because the picture went fuzzy where it has obviously been rewound many times. During the naughty bits the locals went wild - it was so funny. A spot or two of rain added to the effect. We stayed for the 8.30pm film too but were mighty disappointed that the price had doubled! The delicious barbequed steak with shito bought from one of the many side stalls afterwards finished off a very pleasant evening. Without the shopping, cooking, maintenance, driving etc. it is incredible how much time is available in a day. 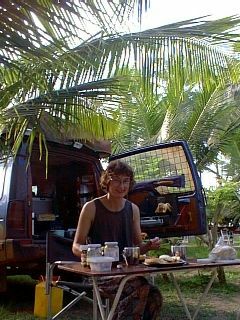 During the walkabout that day I had ordered four English breakfasts for the next morning and had gone through the list of desired foods quite carefully as there was no real menu. When we arrived at the YWCA the following morning we again confirmed the menu and waited for our breakfast. It arrived but with no bacon. The man said it was coming. We finished our breakfast and still no bacon. The waiter then told us there was no bacon!!!! This was to be the highlight of the day but we were being subjected to another "African yes". The Africans are forever optimistic. They say "yes" to everything which should be interpreted as "yes, no, maybe, sometimes...who knows". They have even convinced themselves that they can make the impossible possible. The "African yes" was starting to become a real source of irritation. That afternoon we revised our travel plans for southern Africa. With less time available than we had originally planned we decided to scrap Kenya and Tanzania and to concentrate on the six main southern countries. This way we would reduce travelling time and be back in Cape Town for New Year. That night we went to the cinema - for a change! We had heard "Wild Wild West" was showing at the institute but when we got there we had the option of a Ghanain film or the same Ghanian film. We took the Ghanian film and was treated to a spectacular display of the worst acting ever. Even the locals thought it was hilarious and it was meant to be a serious film. The noise around the hotel commenced at 5.00am when the workers started removing ceramic wall tiles. Andrew went off in search of bacon but returned three hours later empty handed. We had spied another hotel who had bacon on their menu but when we got there - disaster - no bacon left. We ordered chawarma and Lebanese sausages instead. When the bill arrived it was 50% higher than expected. They gave us a line about giving us the wrong menu and that the prices charged were the new rates. Unfortunately the waitress let slip that this happened regularly at which point we had the scam confirmed and paid only according to our prices. This was our last full day in Accra and our American friend Nancy joined us for the rest of the day in sampling the local street food and searching out a nightclub. In the morning we were up early to pack up and get over to the airport as we had been told that the airline overbooked heavily and we had to be sure of getting a seat. Massive queues outside the airport awaited us and we had to fight off a load of locals who thought we were queue jumping when we walked to the front. They couldn't quite grasp the fact that the white guys were not wanting to catch the London flight that they were all queuing up for. In the departure lounge the cafe was being refurbished and we had a three hour wait and a measly snack bar for sustenance. The excitement rose as we moved to the terminal but fell again when they announced a delay. By midday we were on the aircraft where we had the choice of seats because it was only a third full. So much for overbooking. The captain welcomed us, apologised for the delay and said "there was absolutely no excuse for it". One wonders what they were hiding! The DC10 was fabulous. 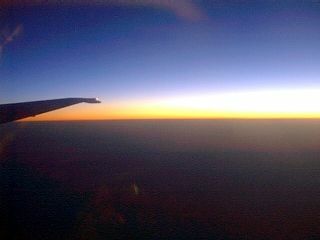 There was loads of leg room, duty free galore and a delicious five course scoff with South African wine. What could be better? With the reduced passenger compliment the cabin staff service was first class. However, there was no film - probably "no excuse for it". 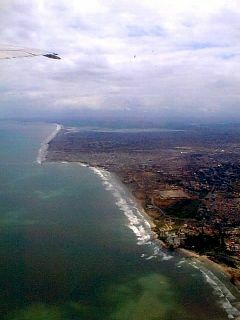 As we took off we waved goodbye to West Africa and headed towards winter. Punda is sent packing..... it was close Turtle and Punda cuddle up together See you in SA You've got to have patience in West Africa A last look round! Ghanian food is fantastic, with the exception of fufu. There is usually a carbohydrate base such as yam, rice, fufu or plantain which are presented in a variety of ways - grilled, deep-fried or mushed. It is served with meat (goat, lamb) or fish in a very spicy sauce. Hot pepper sauce or powder known as shito is used in everything. At night the streets come alive with food stalls where people cook on small barbeque type affairs. "Cow" (not called beef) pasties are common. They have very small amounts of meat and masses of dry pastry. At road junctions hawkers in abundance sell bread, sandwiches, doughnuts. Lebanese food is also common - which I love. This is quite an easy country to get around - they speak English. 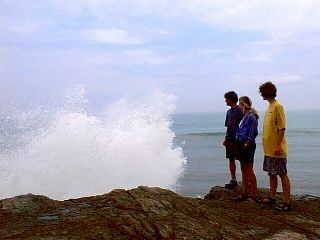 Be prepared for the price banding - one price for locals, twenty times the price for tourists. There are branches of Barclays Bank everywhere. Ryans Irish Pub can be found at N: 05.33.436 W: 00.10.833. M&J Travel can arrange flights etc. but also has internet facilities. It can be found at N: 05.33.944 W: 00.10.950. M.K. 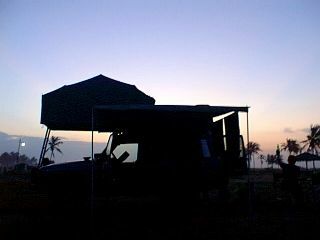 Engineering for Land Rovers is at N: 05.34.242 W: 00.14.674. 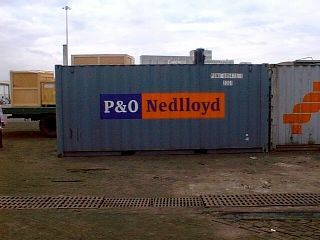 Shipping office for P&O Nedlloyd is that of their partners - Saga at N: 05.37.765 E: 00.00.140. It is out of town. 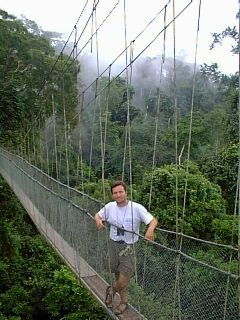 Kakum National Park is at N: 05.20.917 W: 01.23.007.